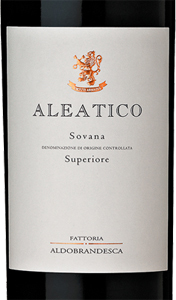 The Aleatico Sovana DOC Superior, Aldobrandesca Farm, by Antinori born at about 200 mt. a.s.l., nestled in a beautiful natural and archaeological landscape. Surprising for its intense ruby red color. Rosehip blend of notes of fresh red fruit aromas. Red enveloping mellow, velvety, with a perfect balance between sweetness and acidity. 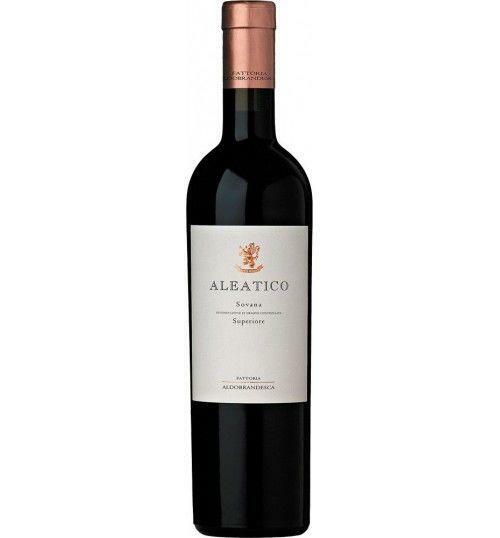 THE WINE The Aleatico Sovana DOC Superior of Antinori born at the Fattoria Aldobrandesca located in the southern part of the Tuscan Maremma, right in the center of what is called “the Etruscan zone of tufaceous rock”. The most common image of the Maremma is that of a maritime zone, one of plains and pine groves, horses and cowboys. The Maremma that we are dealing with here, instead, is the inland part, one which has the indisputable charm of tuff, the rocky bluffs on which, in ancient times, a number of outright fortresses – now open-air museums – such as Pitigliano, Sorano, and Sovana were erected. The vineyards of the Fattoria Aldobrandesca are situated right on a spur of tufaceous rock, surrounded by a lovely panorama of real archeological interest as well. The estate was purchased by the Antinori family in 1995 and extends for over 193 total hectares (more than 480 acres) on a gently descending plain of volcanic origin with tufaceous sub-strata. The property is approximately at 200 meters (650 feet) above sea level. The 2015 vintage was initiallycharacterized by a cold and damp winter. Low temperatures and abundant precipitation led to a slight delay in pruning operations, which terminated during the first week of March. Ample ground water in the soil and rising temperatures during the month of April assisted an excellent budding and development of vine vegetation. Spring gave way to a typically Mediterranean summer, one marked by high temperatures and scarce rainfall along with important temperature swings from daytime heat to evening and nighttime coolness. The grapes intended for a red wine were picked during the first week of October, while those intended for a dried-grape wine remained on the vine and were harvested during the last week of the month. The crop, picked when perfectly ripe, was divided into two parts: one was fermented immediately, the other placed in a dry and well ventilated space in order to dry and obtain a greater concentration in terms both of aroma and of structure. The two parts were nonetheless fermented in the same identical way once they arrived in the cellar. After a delicate pressing, the must macerated on its skins for approximately one week to extract the complex patrimony of aromas, typical color, and intense and balanced flavors. The wine was then run off its skins and fermented at cool temperatures (below 68° Fahrenheit (20° centigrade). Once the desired amount of residual sugar was reached, the fermentation was halted by means of a sudden drop in fermentation temperatures. The wine was conserved at low temperatures prior to bottling. The Fattoria (Farm) Aldobrandesca estate is located near the town of Sovana in the isolated, uncontaminated southern part of the Tuscan Maremma. The area is characterized by its fertility, indeed by its virtually wild character. In this rich territory, the Aldobrandesca estate represents a microcosm of incredible variety. In the space of a very few hectares, the soil takes on many different shadings of color: white pumice stone, tufaceous soils which range fromyellow to garnet red, black volcanic rock. And, yet again, all the various shades of brown. It is here, with this diversity of minerals, that international varieties such as Cabernet Sauvignon and Malbec are cultivated, as is the native Aleatico, all with interesting results, immersed as they are in a microcosm of differing soils and in a temperate micro-climate which benefits from the nearby presence of the Argentario peninsula, jutting out into the Mediterranean Sea. The Aldobrandesca vineyards are located precisely on the slopes of the spur of tufaceous rock on whichSovana is perched, immersed in a breathtaking natural and archaeological panorama. The property was acquired by the Antinori family in 1995 and extends over 193 hectares (some 480 acres) on a gently sloping terrain of volcanic origin with a tufaceous sub-soil. It is situated at approximately 200 meters (660 feet) above sea level. THE COMPANY The Antinori family has been making wine for over six hundred years when, in 1385, Giovanni di Piero Antinori became part dell 'Arte Fiorentina dei Vinattieri. Throughout its long history, spanning 26 generations, the family has always personally managed the business making innovative, sometimes courageous choices, always with unwavering respect for tradition and for the territory. Today the company is headed by Albiera Antinori, with the support of the two sisters Allegra and Alessia, personally involved in the business activities. Marchese Piero Antinori is currently the Honorary President of the company. Tradition, passion and instinct have been the driving qualities that have led Marchesi Antinori to establish itself as one of the leading Italian wine producers. Every vintage, every terroir, every idea you want to put in place is a new beginning, a new quest to raise our quality margins. As Marchese Piero loves to repeat: "ancient roots play an important role in our philosophy, but they have never held back our innovative spirit." The estates of Tuscany and Umbria, historical heritage of the family, have been added with the time investment in other areas suitable for the production of quality wines both in Italy and abroad, where they could embark on a new path of exploitation of new " terroir "high production potential. Marchesi Antinori expresses his passion for winemaking looking for improvement increasingly thin. Why increases in continuous experiments in the vineyards and cellars with selections of native and international clones of grapes, types of crops, vineyard altitudes, fermentation methods and temperatures, traditional and modern vinification techniques, different types of timber size and age of barrels , and varying the length of refining in the bottle. "We have shown over the years that in Tuscany and Umbria it was possible to produce quality wines, recognized internationally, they could show elegance and refinement while maintaining the character originario.La Our library has many titles, but for us is not rich enough. We have a mission that is not fully accomplished, which pushes us to express the vast potential of our vineyards and reconcile again remains to be discovered with the heritage of the Tuscan taste that includes traditional, culture, agriculture, 'artistic and literary These things represent the identity of the Marchesi Antinori, one of the greatest strengths lies in the fact of being Tuscan, or if you prefer, our' Tuscan '. " Piero Antinori The Antinori family is part, since its foundation, the PFV, "Premum Familiae Vini", an informal association of wineries owned by a family. PFV goes beyond geographical borders and keeps a common bond: that of the vineyards properties and the production of wine as a family business to grow and improve, like a fine wine, over time. Tasting Color - intense ruby color Scent - of wild roses give way to aromas of fresh red fruit Taste - is ample, enveloping, and velvety with a perfect balance between sweetness and a vibrant acidity. The Aleatico Sovana DOC Superior of Antinori born at the Fattoria Aldobrandesca located in the southern part of the Tuscan Maremma, right in the center of what is called “the Etruscan zone of tufaceous rock”. The most common image of the Maremma is that of a maritime zone, one of plains and pine groves, horses and cowboys. The Maremma that we are dealing with here, instead, is the inland part, one which has the indisputable charm of tuff, the rocky bluffs on which, in ancient times, a number of outright fortresses – now open-air museums – such as Pitigliano, Sorano, and Sovana were erected. The vineyards of the Fattoria Aldobrandesca are situated right on a spur of tufaceous rock, surrounded by a lovely panorama of real archeological interest as well. The estate was purchased by the Antinori family in 1995 and extends for over 193 total hectares (more than 480 acres) on a gently descending plain of volcanic origin with tufaceous sub-strata. The property is approximately at 200 meters (650 feet) above sea level. The 2015 vintage was initiallycharacterized by a cold and damp winter. Low temperatures and abundant precipitation led to a slight delay in pruning operations, which terminated during the first week of March. Ample ground water in the soil and rising temperatures during the month of April assisted an excellent budding and development of vine vegetation. Spring gave way to a typically Mediterranean summer, one marked by high temperatures and scarce rainfall along with important temperature swings from daytime heat to evening and nighttime coolness. The grapes intended for a red wine were picked during the first week of October, while those intended for a dried-grape wine remained on the vine and were harvested during the last week of the month. The crop, picked when perfectly ripe, was divided into two parts: one was fermented immediately, the other placed in a dry and well ventilated space in order to dry and obtain a greater concentration in terms both of aroma and of structure. The two parts were nonetheless fermented in the same identical way once they arrived in the cellar. After a delicate pressing, the must macerated on its skins for approximately one week to extract the complex patrimony of aromas, typical color, and intense and balanced flavors. The wine was then run off its skins and fermented at cool temperatures (below 68° Fahrenheit (20° centigrade). Once the desired amount of residual sugar was reached, the fermentation was halted by means of a sudden drop in fermentation temperatures. The wine was conserved at low temperatures prior to bottling. The Fattoria (Farm) Aldobrandesca estate is located near the town of Sovana in the isolated, uncontaminated southern part of the Tuscan Maremma. black volcanic rock. And, yet again, all the various shades of brown. by the Antinori family in 1995 and extends over 193 hectares (some 480 acres) on a gently sloping terrain of volcanic origin with a tufaceous sub-soil. It is situated at approximately 200 meters (660 feet) above sea level. Today the company is headed by Albiera Antinori, with the support of the two sisters Allegra and Alessia, personally involved in the business activities. Marchese Piero Antinori is currently the Honorary President of the company. Tradition, passion and instinct have been the driving qualities that have led Marchesi Antinori to establish itself as one of the leading Italian wine producers. Every vintage, every terroir, every idea you want to put in place is a new beginning, a new quest to raise our quality margins. As Marchese Piero loves to repeat: "ancient roots play an important role in our philosophy, but they have never held back our innovative spirit." The estates of Tuscany and Umbria, historical heritage of the family, have been added with the time investment in other areas suitable for the production of quality wines both in Italy and abroad, where they could embark on a new path of exploitation of new " terroir "high production potential. Marchesi Antinori expresses his passion for winemaking looking for improvement increasingly thin. Why increases in continuous experiments in the vineyards and cellars with selections of native and international clones of grapes, types of crops, vineyard altitudes, fermentation methods and temperatures, traditional and modern vinification techniques, different types of timber size and age of barrels , and varying the length of refining in the bottle. The Antinori family is part, since its foundation, the PFV, "Premum Familiae Vini", an informal association of wineries owned by a family. PFV goes beyond geographical borders and keeps a common bond: that of the vineyards properties and the production of wine as a family business to grow and improve, like a fine wine, over time.